As you some may or may not know, the governing body of AJPW is Pacific Wrestling Federation (PWF). The PWF sanctions all championship matches and has absolute authoirty over match making. We have been without a PWF president for quite some time, but I'm pleased to announce that, as of February 2002, that position has been filled. Please welcome our new PWF President... Masanobu Fuchi!!! Just as recently as last month, I was an active competitor and was trying to chase one more run at a Junior Heavyweight Crown. However, during my last match it became clear to me that my body could no longer keep up with my spirit. While I am young at heart and thought I could continue to wrestle well into my 60's like a true iron man, my body is telling me otherwise. I told myself I would leave active competition if I felt the business has passed me by, and with how strong a roster AJPW has and how great the junior division is... a difficult decision had to be made. I had to be honest with myself and admit it's not my time anymore. HOWEVER, I have a lot yet to give to AJPW and I am honored that All Japan came to me with the proposition to become President of the PWF. As far as I was concerned, it was a once in a lifetime opportunity that I could not pass up! I will do everything in my power to make sure athletes are rewarded for their efforts, make fair title matches, and make sure everybody gets an opportunity to succeed under the AJPW banner! I will do right by Giant Baba, Jumbo Tsuruta, Stan Hansen and every AJPW legend that knows what it means to fight on the royal road. As everybody is aware, as a result of winning the January 2nd Korakuen Hall Battle Royal, Kenta Kobashi is owed a Triple Crown Championship match against Toshiaki Kawada. 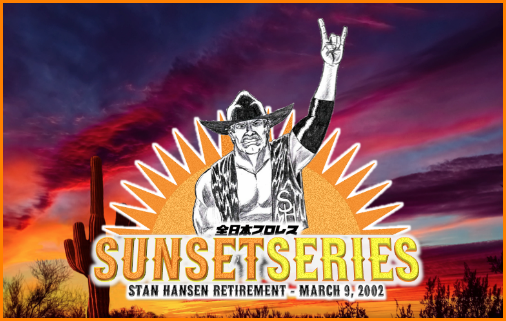 That match was originally signed to take place at February's Excite Series, however, due to both men having a tremendous amount of respect for Stan Hansen, both men have agreed to push their match to March's Sunset Series final night where Stan Hansen will be officially having his retirement ceremony. Both Kawada & Kobashi have told me there is no better way to honor Hansen-san than by putting on a classic King's Road showcase in his name.! Originally Posted by NEXT SHOW!! - Yoshihiro Takayama vs. Rey Mysterio Jr.
thanks for the warm welcome back, lads! Not sure if anybody will predict because I, myself, was very rusty trying to remember what was going on in this timeline, but figured why not jump right in and try to pick up things where they left off! Holy Demon Army (Kawada & Taue) vs. Burning (Kobashi & Kojima) - I'm gonna go with a time limit draw because this is AJPW in the early 2000s with the Pillars still ruling the company. Yoshihiro Takayama vs. Rey Mysterio Jr.
AJPW Jr. Heavyweight Championship: Champion Yoshinobu Kanemaru vs. Challenger Shinjiro Ohtani - Kanemaru seems destined to run the Junior Division till Marufuji and KENTA are ready to murder him! AJPW All-Asia Tag Team Championships: Champions Takashi Sugiura & Samoa Joe vs. Challengers Mitsuharu Misawa & Yoshinari Ogawa - I hope the Ring Rat dies! Last edited by DGenerationMC : 11-08-2018 at 08:37 PM. How much do I have to pay you to see Ring Rat Ogawa die in this match? When it comes to wrestling, Ogawa is a cursed name. -My favorite diary of all time. Welcome Back!!! I take full credit for the return of the diary... PUSH HARASHIMA! I second that idea by Larrikn. Who is this Samoa Joe everyone is talking about when you can push the sexiest Future Ace of AJPW... HARASHIMA!! In an opening match that was fairly one sided, Tamon Honda & Masao Inoue defeated Hiro Harashima & Daisuke Sekimoto in 7:32 when Inoue pinned Sekimoto. In a very competitive match with good wrestling, "Dr. Death" Steve Williams, Jinsei Shinzaki, & Hayabusa defeated Hiroshi Hase, & Wild II (Takeshi Morishima & Takeshi Rikio) in 12:14 when Hayabusa landed a 450 Splash onto Rikio. Morishima tries to get into the ring to break up the pinfall, but was too late. Morishima looks visibly disappointed because this now makes it since November that they've last come out victorious at a big event. Rikio gets to his feet, makes eye contact with Morishima, and shares his disappointment by nodding his head. He doesn't even say a word to Morishima because they're both thinking the same thing: something has got to change. Wild II may be slipping right before our eyes and they have to figure out how to fix their momentum if they hope to stay together. In rematch from last month that was filled with good action, Yoshinobu Kanemaru defeated Shinjiro Otani in 15:02 after Kanemaru hit Otani with Deep Impact. Kanemaru celebrates as he proves last month's victory over Otani was no fluke! Before he can celebrate for too long, Hayabusa comes down to the ring and challenges Kanemaru for his title! Kanemaru thinks it over for a brief second, and he gladly accepts! 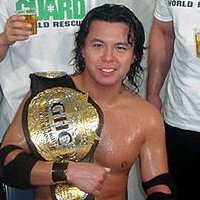 After 13 minutes of wrestling styles colliding, Yoshihiro Takayama (w/ Akira Maeda) defeated Rey Mysterio Jr. via a devastating sit-out power bomb. The power bomb came after Takayama countered an attempted springboard Hurricanrana from Mysterio. Takayama stands tall over Mysterio and cleans his hands as if Mysterio was nothing. Maeda says he wants the little junior out of his ring, and Takayama obliges by picking Rey up by his tights with one hand and deposits him over the top rope to the floor with ease. Maeda implies one down, one to go when Suzuki takes on Guerrero later tonight. Takashi Sugiura & Samoa Joe defeated Mitsuharu Misawa & Yoshinari Ogawa in 14:05 when Sugiura made Ogawa give up to an Ankle Lock. During the match, Samoa Joe hurt Mitsuharu Misawa with a botched suplex. While the injury wasn't anything too serious, Misawa was very angry and Joe now has big heat. This has been a bad few weeks for Joe because, on Night 3 of the tour, he punched Jinsei Shinzaki in the face backstage. Seeing as Joe is still technically a young boy, hurt THE guy and then got into a fight, he is expected to be terminated in the morning. A video package and an in-arena announcement is officially made stating that, for AJPW's next big event, they will be returning to the Nippon Budokan to hold Stan Hansen's retirement ceremony. Although he won't be wrestling, Hansen will join AJPW for the entire tour so he can say goodbye to all the Japanese fans in every city they visit, with the tour culminating in Tokyo at the Budokan with a Texas sized celebration of Hansen's career. In a match that had great heat and featured wrestling that can only be described as magnificent, Eddie Guerrero defeated Minoru Suzuki (w/ Akira Maeda) in 17:45 after Guerrero landed a Frogsplash onto Suzuki. Guerrero picks up a big win and evens tonight's series between Eddie/Rey & DEATHSQUAD at 1-1. Suzuki is really selling his ribs and is in a lot of pain. He is visibly gasping for air as Takayama comes out to aide his partner. Big Tak slings Suzuki over his shoulder like a sack of potatoes as DEATHSQUAD head to the back. Rey joins Eddie in the ring and they both signal to DEATHSQUAD that they want those Unified World Tag Team titles! 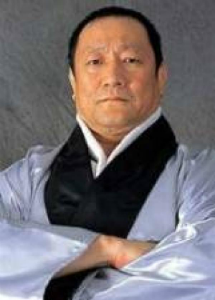 In a match that was filled with incredible wrestling, Burning (Kenta Kobashi & Satoshi Kojima) defeated Holy Demon Army (Toshiaki Kawada & Akira Taue) in 29:47 when Kobashi pinned Kawada following a barage of chops & strikes, with a Burning Lariat being the killer blow. Kobashi has done it! Last month, he killed his nemesis Akiyama and got rid of Invictus... and now he picks up a huge win over the Triple Crown Champion! All the momentum is in Kobashi's corner, only next time when he and Kawada fight it will be for the whole ball game! Kawada is being checked on by ringside staff and young boys, but he brushes them off and gets to his feet. Kawada isn't so much physically hurt as it is his ego is hurt because, dating back to their encounter in the Tag League, this is the 2nd time in-a-row Holy Demon Army have lost to Burning. Has doubt begun to creep into Kawada's mind that maybe Kobashi has his number? Kawada has a stare down with Kobashi & Kojima. Taue grabs Kawada by the shoulder to signal for him that it's time to go and that he'll get him next month when it matters most; Holy Demon Army exit as the teams don't exchange handshakes. Kojima gets on the mic and thanks the fans for coming out and supporting Burning tonight! He said he didn't think he & Kobashi were gonna have what it took to beat such a great unit like Holy Demon Army, but, with the support of all the fans here at Budokan, they found a way! Kobashi also thanks the fans, but then goes onto say it has been a long time since he had a Triple Crown title match, and that next month, on Stan Hansen's big retirement night, he will do his best to take the Crown! He reminds the crowd that this is the closest he has been to the Triple Crown since June 2000 and that, during his rehab to get back, the 2 things that got him thru it were 1) getting revenge on Jun Akiyama & 2) getting the Triple Crown back. He says one of those goals is complete, and next month he'll give it everything he has to try and beat Kawada! As a prize, here is a rare Ogawa!! Thanks for reading and thanks to all the lads that predicted! Had to slowly refresh/progress some storylines here, but I had to reset the tone and things will most def pick up in the next show. Big show up next and then the Champion Carnival + Egg Dome show on the horizon! If anything was bad or any other comments or critiques, let me know! also press S to spit on Samoa Joe. Wasted like 5-months building him and hot shotting him past young boy status and this is what happens smh oh well could've been worse. At least he was in a team and Sugiura was the benefactor of the wins as well. Last edited by Body By THawk : 11-09-2018 at 10:16 PM. YOU HAD ONE JOB JOE!! WHY MISAWA?!? WHY DIDN'T YOU HIT THE BOTCH-PLEX ON OGAWA FFS!!! Now that I'm calm. GG Everyone, The Ace of Prediction Games has arrived and would like you to move aside as I air guitar my way to the top! Great to see this back, Hawk. And not surprised about Samoa Joe flaming out, though I didn't think it'd be like this. This is where you rebuild with Sugiura, though. Maybe swap one Samoan for another and pick up Sonny Siaki if he's available?